Need help with research at home? Click HERE to Visit our Online Research Portal! IMC News You Can Use! We meet once a month after school in the IMC until 3:15pm! We talk books, movies, and more so stop in and join us! All are invited. For a schedule of dates, please stop in the IMC and ask for a handout. We focus on genres instead of all reading the same title, so you can miss a few meetings and come right back to us! Have a Smartphone or Tablet? 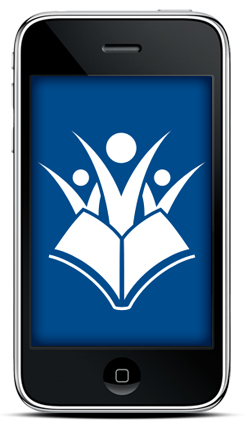 Download this FREE App to see what materials are available for check out in our IMC (including eBooks)! Visit Mrs. Wojtecki's Wikispace for help with research for specific class projects as well as general IMC, eBook how-to's, Google apps how to's, and much more! Gale Databases and online books can also be accessed from your smart devices. Search for articles, read our eBooks right from your phone. Remember you can find passwords for all our databases in your Student Agenda, or email Mrs. Wojtecki! Quizlet.com Create custom flash cards and games that you can study online or on your mobile device. Stop by the IMC if you would like assistance. Google or Chromebook issues? We can help! Bring it in for us! Lost a Chromebook charger? Replacement is $15 and we can give you a new one during the school day, or before/after school until 2:30pm. *IMC Student STAFF: Shelving, Reordering, and Sorting-must pass highest levels.